I will be happier when the day comes -- and the day may never come -- when Prime Minister Abe Shinzo's minions stop pretending that the PM's meeting the persons he vacations with is work. ...which was a quid pro quo for Sasakawa's being one of the guests, along with Mori, Motegi, Hagiuda and Environment Minister Ishihara Nobuteru, at the dinner at the Abe vacation villa on 15 August 2013, in the evening after the PM had completed his 2013 End-of-War day responsibilities and had his hair done at the Imperial Palace Hotel. 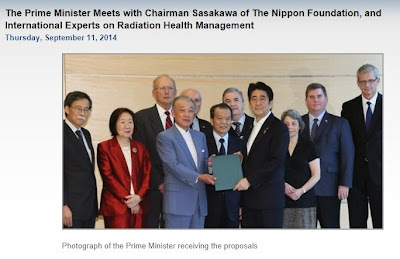 Yes, the Nippon Foundation funds important work. 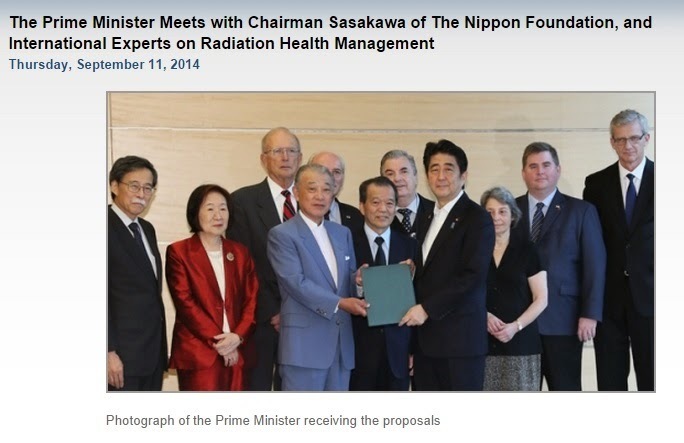 No, that does not make it OK for the Kantei to pin up a photo of Sasakawa-san with his employees and collaborators, pretending that the group got a face-to-face with the PM on the merits. Oh, The Persons You Will Talk To!